I can definitely get down with that! Happy #IWD to all of you lovely ladies out there! In honor of this day, I thought it would be completely appropriate to announce that I have been nominated for the Liebster Award! What is that you ask? It is an online award given to bloggers by other bloggers. It is a fun way to encourage them to keep on blogging and to also spread the word about other great bloggers out there. To participate you must answer the questions from the person who nominated you – and then tag some other great bloggers with some questions of your own. I would like to thank NuRechia Harris of A Perfect Jean for nominating me! If you love jeans as much as I do, you should definitely check out her blog. She considers herself, “a bit of a jean connoisseur,” so if you are interested in finding the perfect pair, she is your girl! So, lets get to these Q&A’s! I started blogging because I have always been a writer. Ever since I was a little girl, I found myself journaling and writing stories. I then studied journalism in high school and a little bit in college. Blogging is a way for me to feed that hunger to write and also share parts of me with other people. I also want to some how help someone else through what I share in my blogs. What do you do when you are not blogging? When I am not blogging, I am working or spending time with my friends and family. I also love to workout, cook, and scroll on social media. One of my favorite blogs right now is Uptown With Elly Brown – I love her style. It reminds me of what I WISH my closet looked like. I do not really have a favorite book – but, I do love reading. One of my earliest memories of a favorite book was “Are you there God? It’s me, Margaret” – It’s a Judy Blume book – I read it when I was 10 or 11 years old, and I really connected with the main character. My dream job is to be an Entrepenuer running my own business of some sort. It would be wonderful having the freedom to stay home with the kids I pray to have one day. If your life were a movie what would it be and why? If my life were a movie it would be “Pitch Perfect.” Mainly because I like to make my own rhythm and sometimes I do it acapella. Singing and dancing whether there is music or not – I quite literally do this. My favorite dessert is a big ol’, warm, ooey-gooey, CINNABUN from the mall. Or, my own remix that I make at home – topped with cream cheese icing. What three beauty products can’t you live without? I can not live without LOTION, raw African Black Soap, and brow definer. I handle a stressful day by praying through it, honestly. I also like to talk about how I am feeling to someone close to me. I hate holding my feelings in – so it helps to talk about the stress for me. I am inspired by other people that live their live’s without inhibitions. I am inspired by positivity. I am inspired by nature – I love being outside on a beautiful day, soaking it all in. That inspires me. What advise would you give to someone interested in blogging? Just do it. Learn as you go! 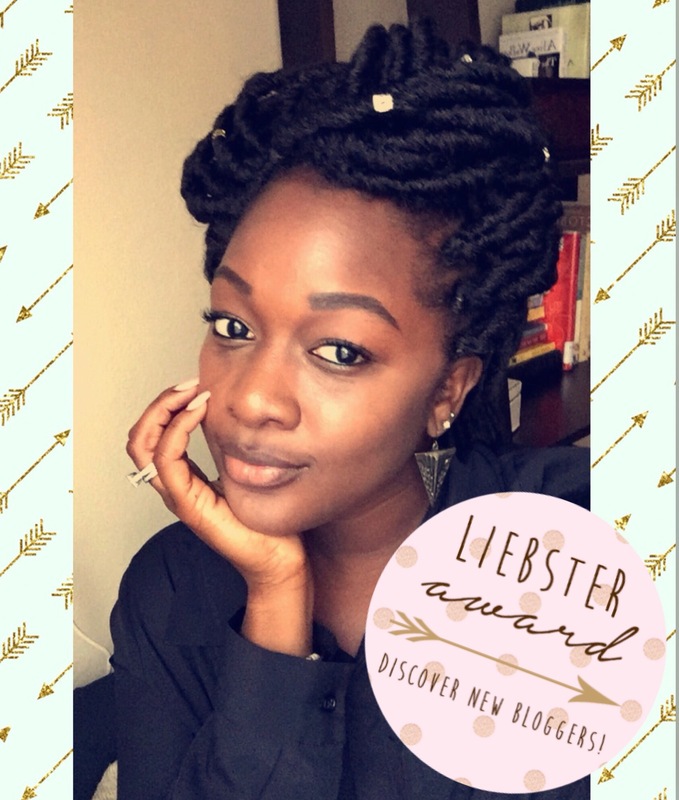 I would like to nominate the following 5 blogs for the Liebster Award! Do you prefer salty or sweet foods? What is something really interesting about you that people may not know? What is your blogs main objective? What is something that completely annoys you? Thanks for reading and don’t forget the great blogs that I nominated above!